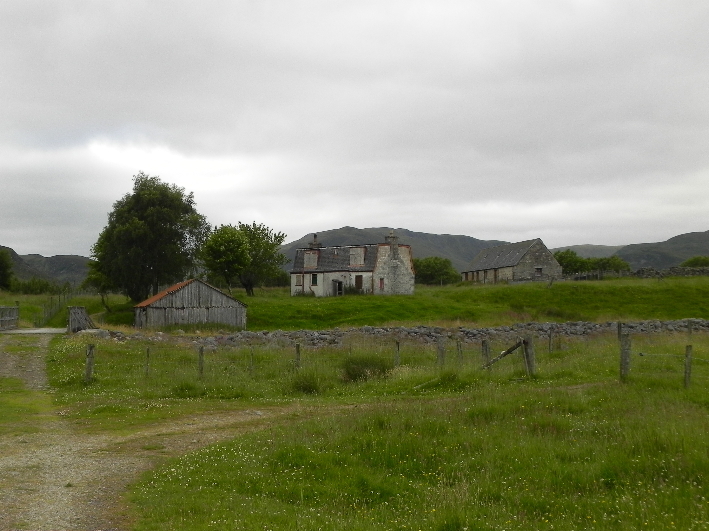 For a month in which it had persistently rained we had managed to pick two days at Newtonmore where the weather was dry. Like yesterday there was some cloud, and although it had been so cold at one point that we thought it would snow, it had came to nothing, and indeed had warmed up as we reached our last Munro. Today was to start in a similar vein, the radio forecast promising cloud free tops and wind later, but dry overall. 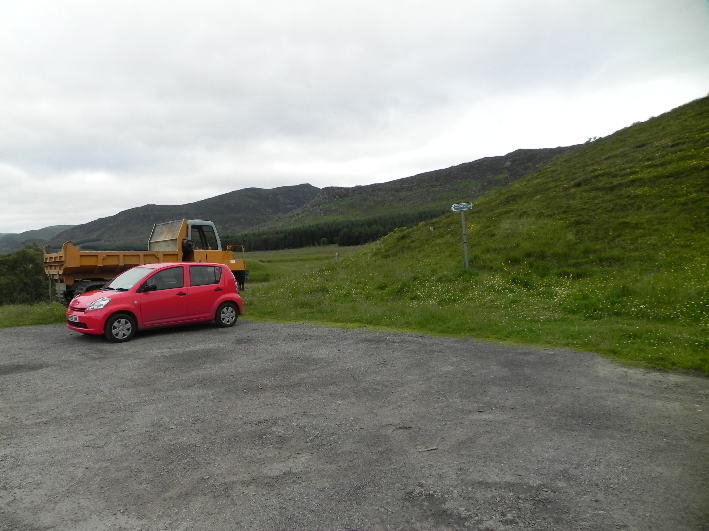 From the car park at NN 692 997 we headed west to Glenballoch. It’s sad to see places like this lie dormant, and I added the renovation of this cottage to my mental to-do list for when I win the lottery. I suppose I should buy a ticket though. We peered in the outbuildings, and Jim noticed signs of owls in residence. 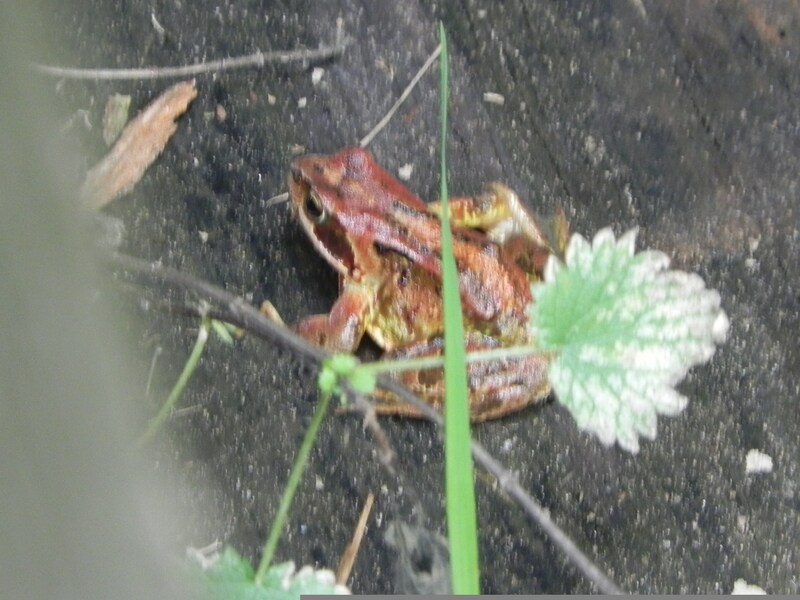 Either brave or oblivious to them, but this frog seemed unperturbed. 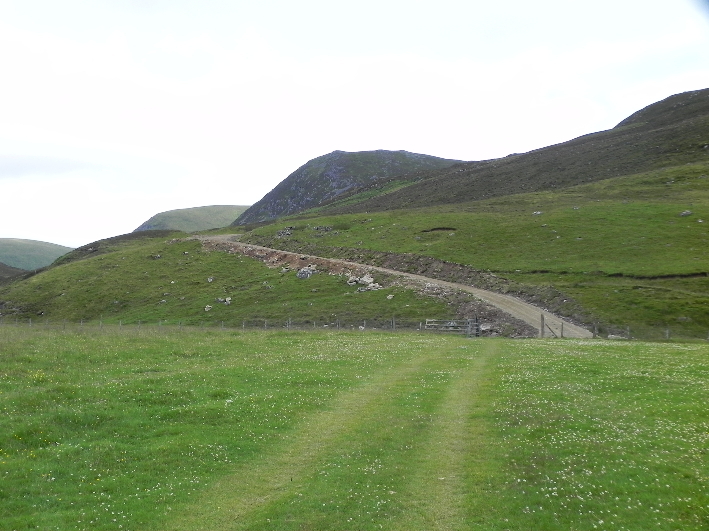 The path up the glen has been upgraded at one point, a bulldozed monstrosity, which epitomises the campaign against unrestricted construction of tracks in the hills. Having said that it’s nothing when compared to the windfarm further north, visible from yesterdays walk, and todays, with a surfaced access road which can be seen from miles away snaking across the hills. 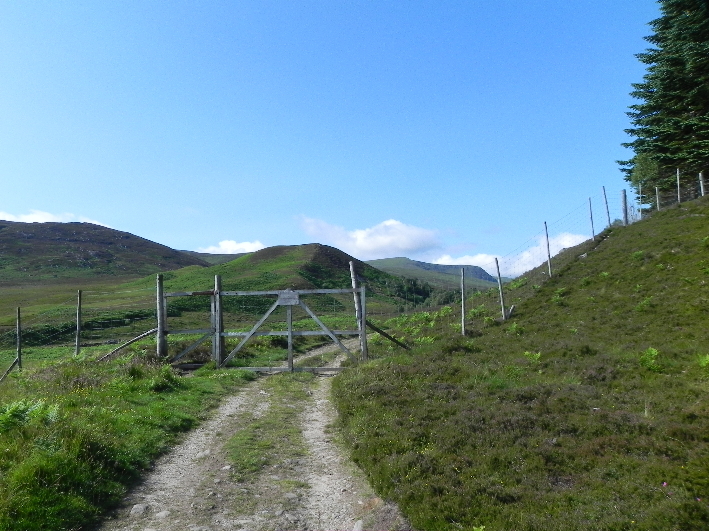 Within a short distance though it becomes apparent this isn’t a new track, as the older track continues up the glen. We are surrounded on all sides by deer, and Jim’s attempt at imitating a stag calling certainly makes them take notice. 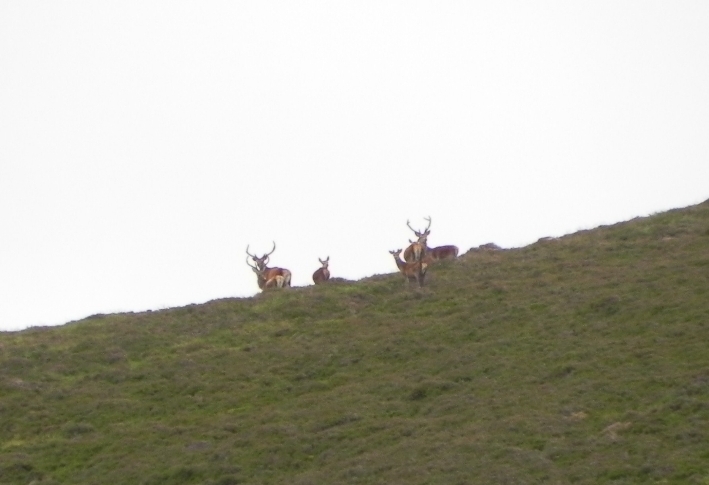 We could stay and watch these creatures all day, but with a 5pm deadline to meet we head off, onwards and upwards. 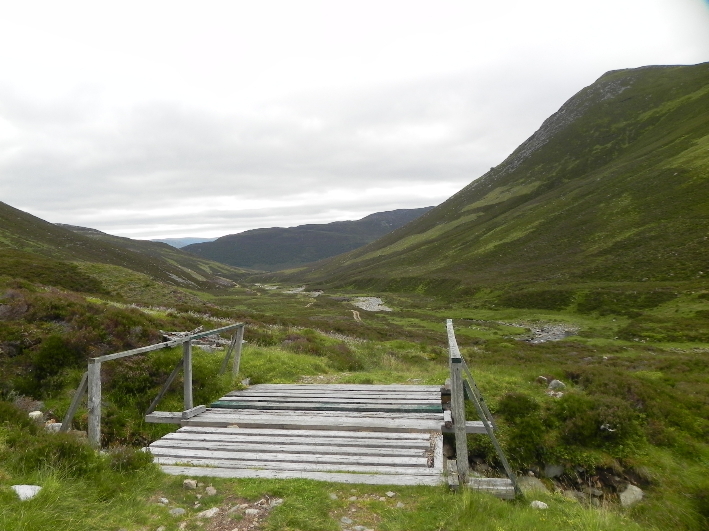 Not long after crossing a footbridge the vehicular path ends, at NH 662 018, and a footpath drops down to cross the Allt Fionndrigh, before climbing up into a pass between Meall na Ceardaich and Creag Liath, where the path ends. The terrain ahead looked rough and decisions had to be made. What route? Across the glen there appeared to be a way on to the ridge which involved dropping down and crossing the burn, before ascending near Carn Macoul, and onto the ridge. 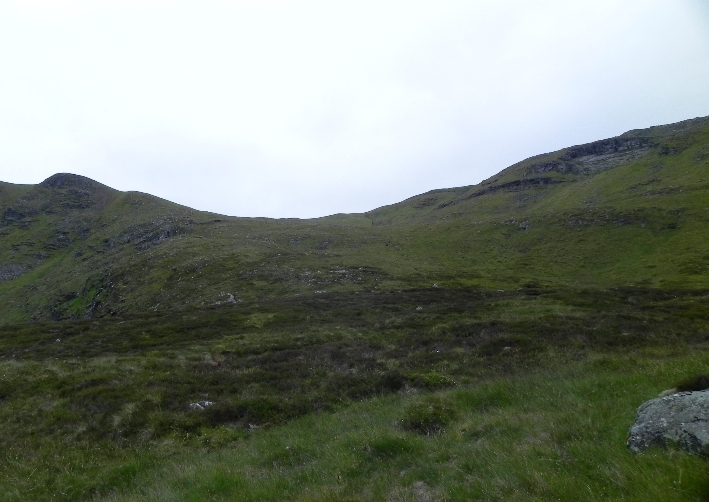 The other way, uphill to the head of Gleann Ballach, then to the bealach between Carn Dearg and Carn Ban. The other deciding factor was my knee- would it hold up? 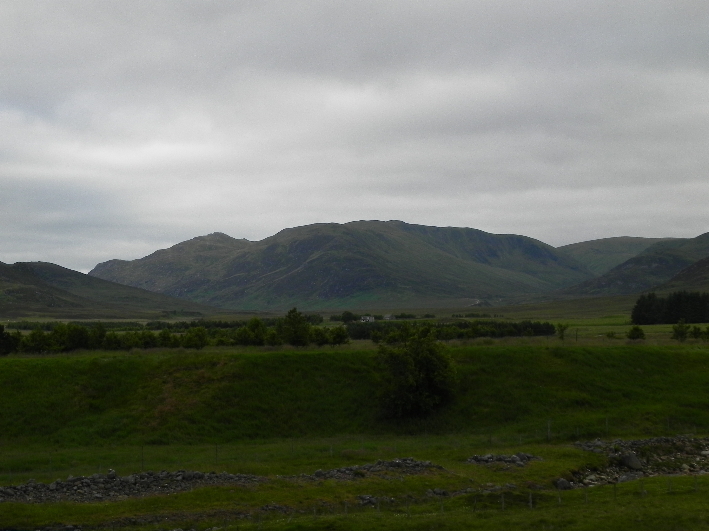 This glen was not the kind of place you would want to get into difficulty in. With a neoprene support and painkillers my knee had seemed capable, so it was a question of route. The planned route up the glen was picked, we turned to the north and started uphill. Carn Dearg from the pass. Thankfully there’s not a great heat either, the breeze keeping things manageable. This journey in heat would be hellish and we are glad that at the moment a breeze is keeping us cool. Eventually we reach the head of the glen and pick our way out to catch our breath and drop our bags at the bealach, before climbing up onto the wind whipped summit of Carn Dearg, a large raptor, possibly an osprey, shot past below us and we raced across the top to confirm it was, but on that wind it had gone within a few short seconds. From here we could see across to Creag Meagaidh, the adjacent Loch Laggan immediately recognisable by the island like Binnean Shios prominent between it and Lochan na H-Earba. The wind didn’t invite us to stay, so we dropped down to the relative calm of the bealach for a quick lunch before moving on. 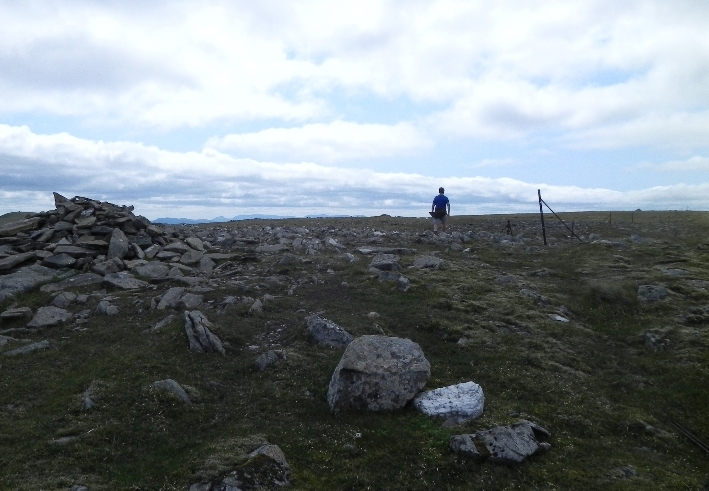 We climbed up onto Carn Ban and from here navigation becomes straightforward, even if the going underfoot isn’t, as the remains of a an old metal fence can be followed all the way to the next Munro, Carn Sgulain. Before that is reached however there are a fair few ups and downs. 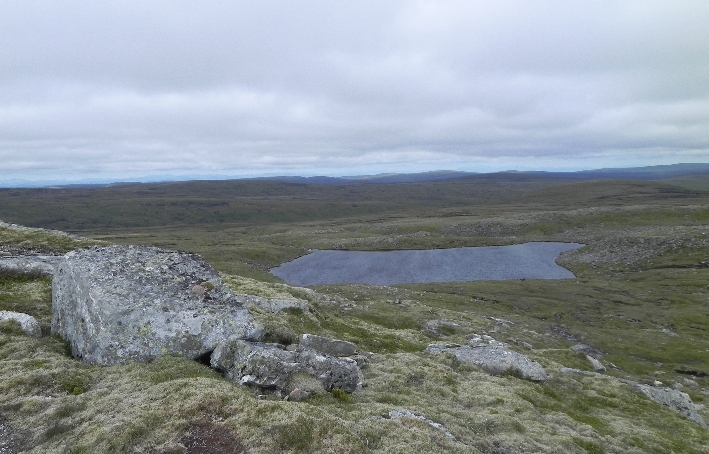 The first down is to skirt just south of Lochan Uisge. 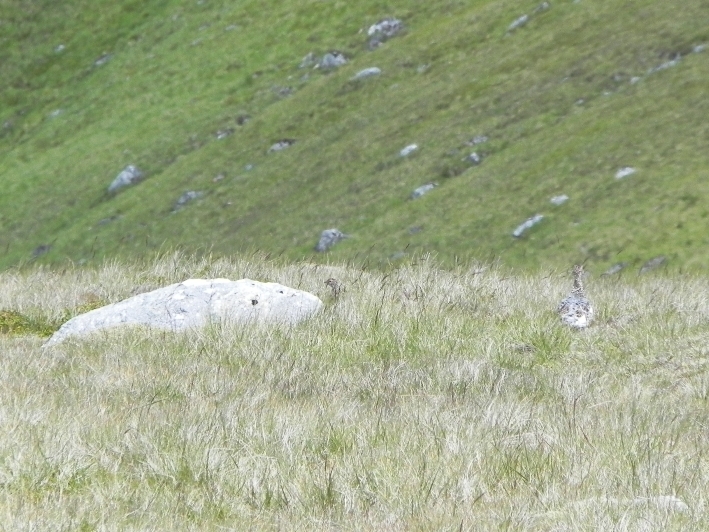 At this point there were a fair number of mountain hares, the first I’d seen this year without a white coat. From here on it’s a fairly rocky path and the tops fall fairly easily, Carn Ballach at 920m, Meall na Creughaich and Meall a Bhothain all ticked off with ease. I quite enjoy the undulation of ridge walking, and if the weather is good you can be rewarded with decent views on all sides. Sometimes if you are concentrating on what’s in the distance you can miss what’s under your feet, and in this case it was a family of publicity-shy ptarmigan, which waddled off into the thick heather as we approached, refusing to pose for photographs. 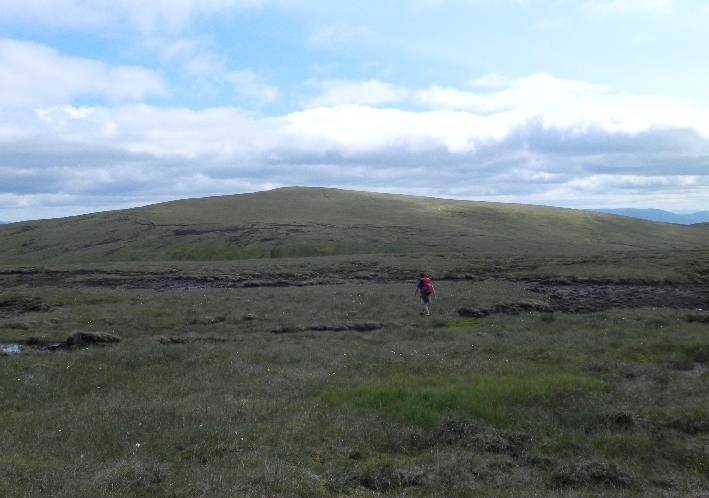 Between Meall a Bhothain and the unnamed top spot height 908m is a messy bog which required care to cross. On a wet day it must be an absolute nightmare, but today it caused only a small amount of head scratching before crossing. We had been pushing a fair old pace, but were still behind for a 5pm finish. 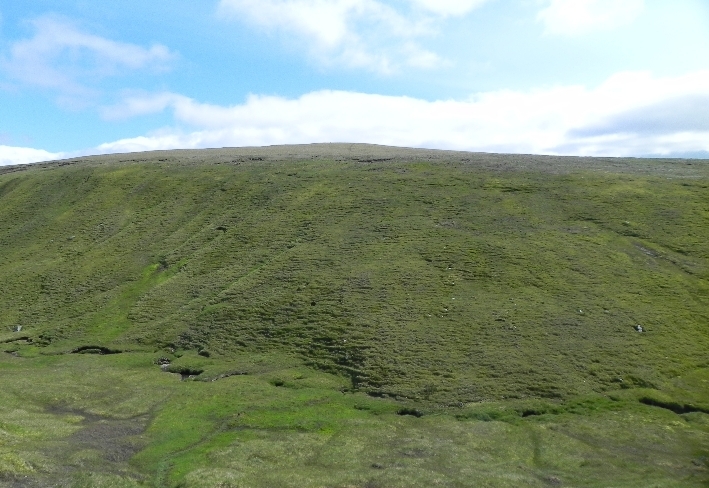 From here we could see that what passed for a path up to Carn Sgulain passed over a morass of small peat hags and peat bog, and the direct route from that summit to our last Munro of the day would involve a plowter through even more of the same. 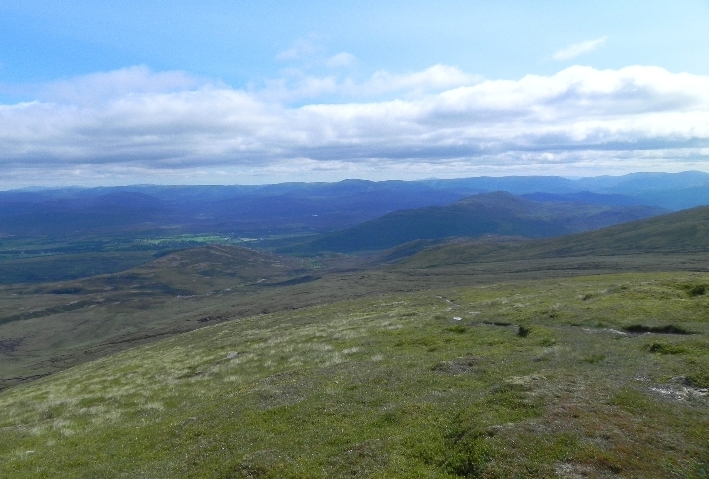 Good visibility gives the advantage of being able to plan a route, and we decided that the easiest going would be to go from hill 908 to Carn Sgulain, return to the same point, pick up our rucksacks and go from there to A’ Chailleach. 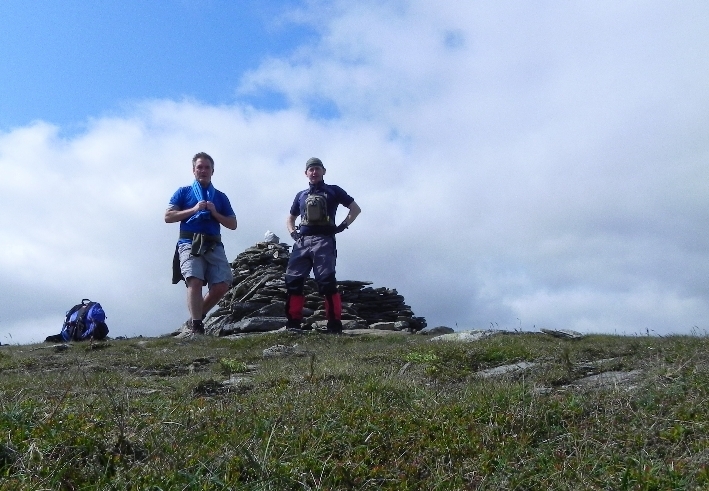 With an eye on the clock we headed off to finally reach the cairn of Munro number two of the day. If there is one thing that bugs me it’s multiple summit cairns and this hill had two. Spoiled for choice, the GPS showed that the farther away one was at the actual summit. It’s never the nearer one, is it? The weather report had warned of gusting winds later, and a quick check on the anenometer showed the wind was just over the 50mph mark. Not ideal for hanging around in, we headed back to the poor hill with no name, for a quick break, where I treated a blister before it could come to anything. Laces tightened, belly topped up and we were off! Tussocks of heather and peat hags seem to be the in thing here, and there were more to come. 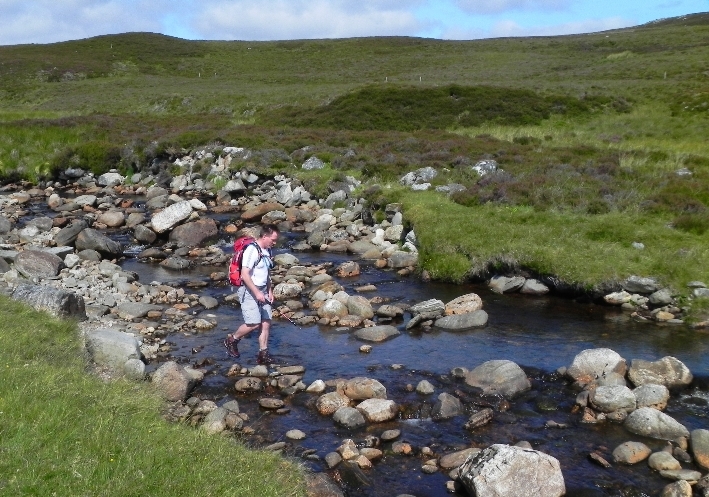 We picked our way through them and dropped in to the Allt Cuil na Caillich where we were hit by a heatwave. Out of the wind this spot was baking hot and lush green, a massive difference from the cold wind which had scoured us on the tops above. 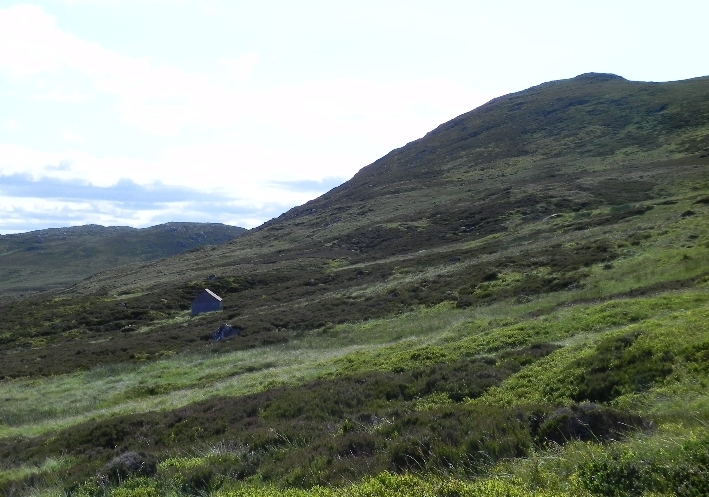 The south slope of A’ Chailleach rises up here, short green grass, a massive difference from the other side of the burn. Having had difficult going for much of the day I’m surprised when we arrive at the cairn only 25 minutes after setting off from where we had a break, as I’d have expected another 15 minutes hard going. 100 not out! 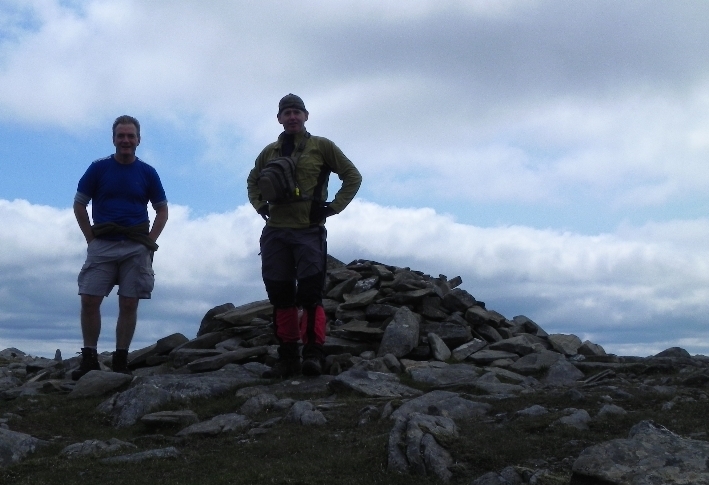 A' Chailleach summit. 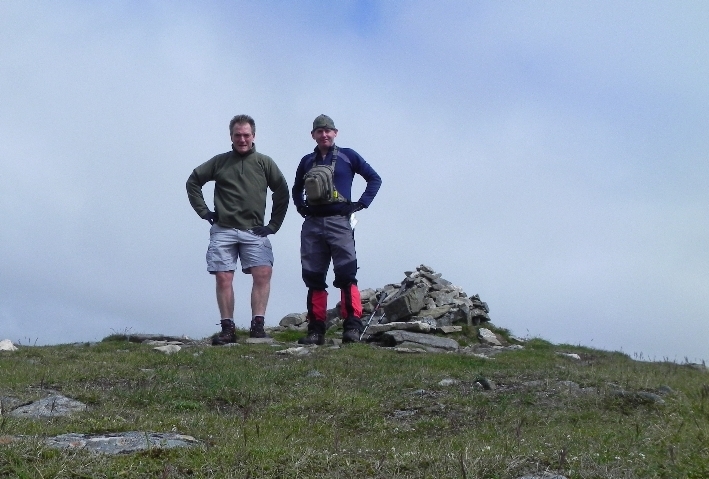 I’d waited a long time for this summit- my hundredth Munro! Metaphorically speaking this walk represented my walking career so far, a long plod, becoming bogged down in the peat bog of repeat ascents and then a quick final burst to the finish. But like any other landmark it just marks the passing of one stage to another, in this case, down to the cars. My sore knee reintroduced itself, and we dropped down out of the wind for a last break before returning to the car. 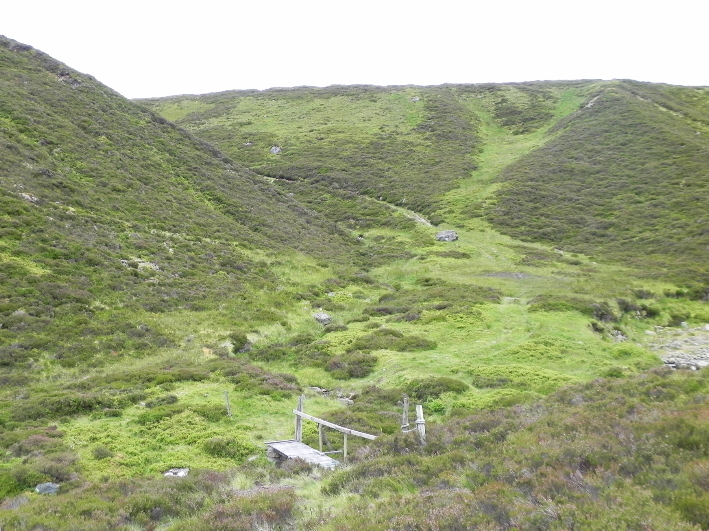 The map shows a path leading off the summit to the south west, but I couldn’t see any sign of it. Instead we followed a well worn path south which soon petered out in a maze of peat hags, where Jim and I seemed to drift further apart then meet up as we followed the remnants of footprints through the muck. Out of the wind now, and the heat was on, and I was glad we hadn’t been climbing in this heat, which would have drained us within a short time. We quickly picked up the land-rover track and were soon passing the plantations which indicated we were almost at the car park. Within a few minutes we were there, with 25 minutes left before our self imposed deadline. A quick check of the GPS revealed we had covered 15 miles in 8 hours. On any other day a beer would definitely be called for, but instead we were homeward bound, down the A9, the sun beating down on the car. Time for a break, time to allow the knee to recover and to make plans for the future. 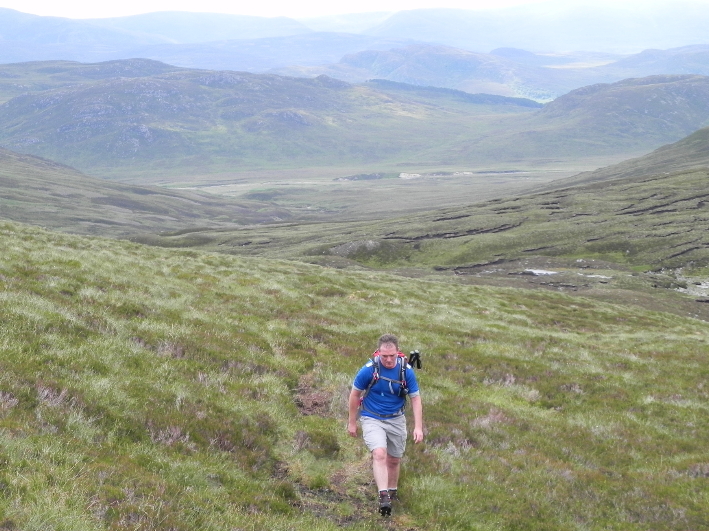 After 100 Munros, there are plenty more hills left to do. The odd missed summits still to be picked off in some areas and new areas to explore. Now where’s that map? Excellent report Jester. Congrats on reaching the 100. Just as well the peat hags are reasonably dry at the moment or that would have been torture. Glad your knee held up under the strain. Great report. Congrats on the 100 mark. Like Monty said I think I'll keep these for a dry spell, I've had enough of peat hags. Whether it can take the strain of another hundred- who knows. Fingers crossed!